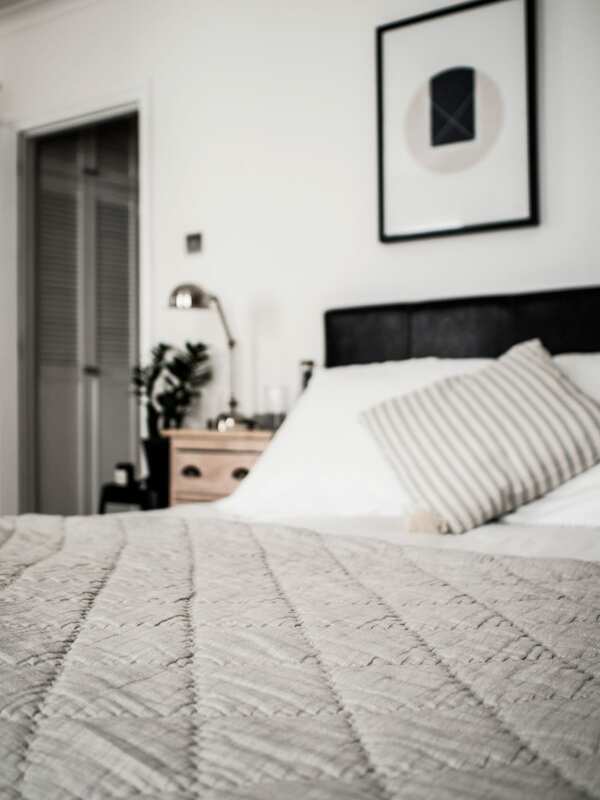 Finding good textiles to use in the bedroom is vital if you want to create an inviting, warm space that you feel comfortable in. 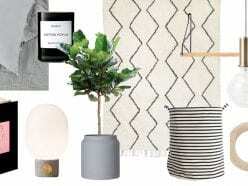 I thought I’d share a few of my favourite brands and items, as I begin to share my home with you on Style&Minimalism. From duvets to rugs, pillowcases to blankets, I’ve tried all sorts and have been lucky to discover some really great products. Without a good night’s sleep I can’t function so finding bedding that works for both me and Dan was really important. We were given our Hungarian goose down duvet as a Christmas present, and have been very happy with it, at 10.5 togs it’s both lightweight and warm. 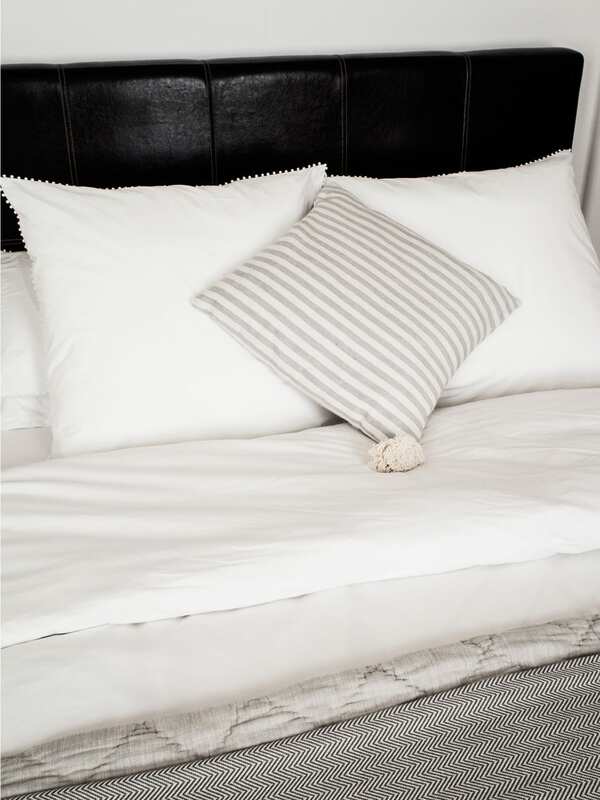 Our pillows are a new addition from The White Company. The large square ones are great for sitting up and reading in bed, and the standard pillows are a special design with three chambers for a better sleeping position. The two outer chambers have more supportive feathers for side sleepers and the central chamber has more soft down ideal for front or back sleepers. I’ve definitely noticed an improvement in how my neck feels when I wake up. 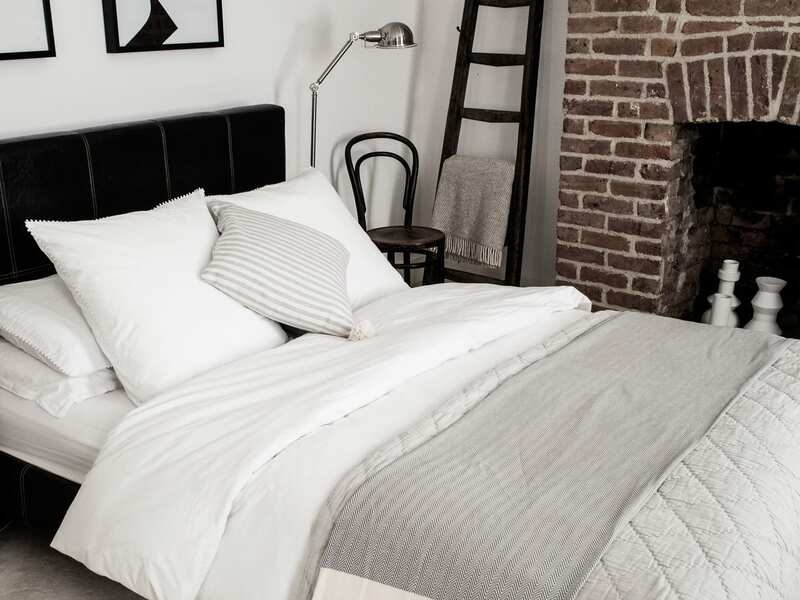 Bedlinen can also make a huge difference to how I feel in bed, I prefer cotton sheets as they feel fresh and clean, and usually go for a simple palette of white and pale grey. I’ve experimented a little with linen pillowcases and although I like the look and feel of them they’re not as soft on my face as cotton. 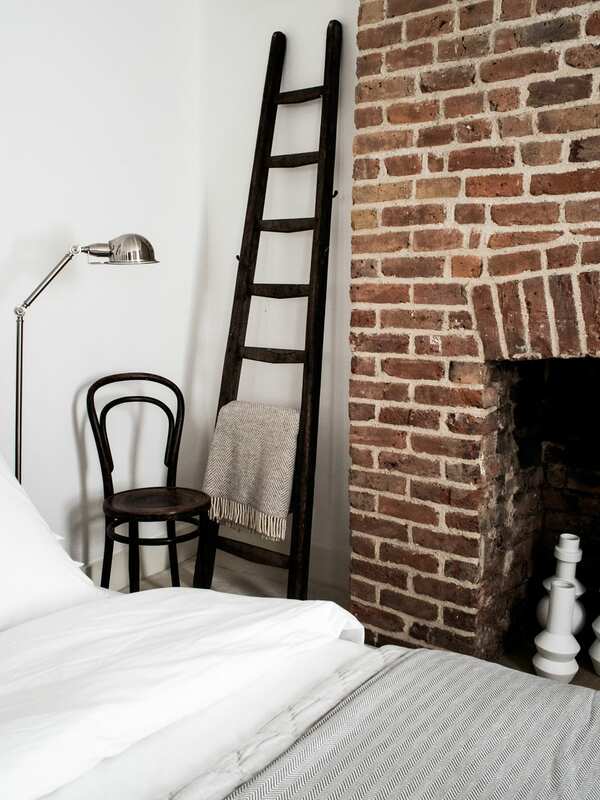 The square pillowcases and top standard pillowcases are from The White Company’s Avignon collection. 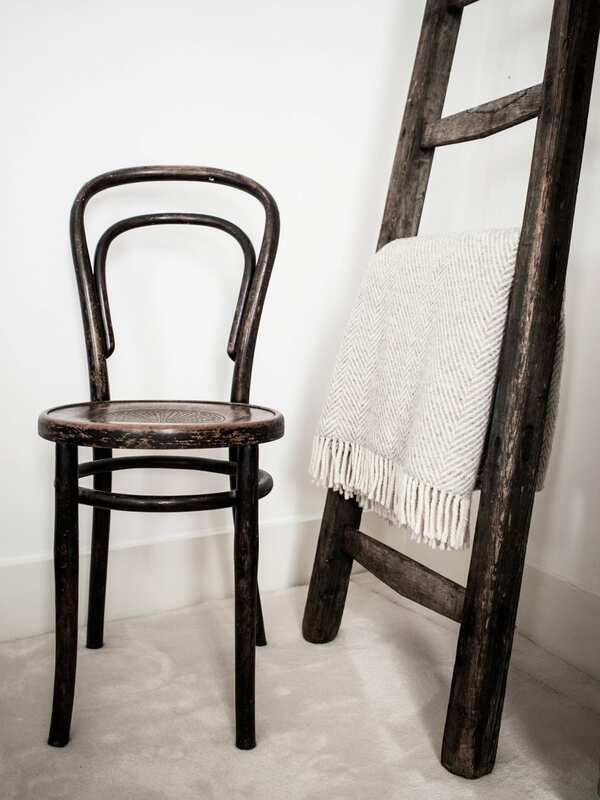 I love the little pom-pom details along the edges, it’s fun but still quite minimal. 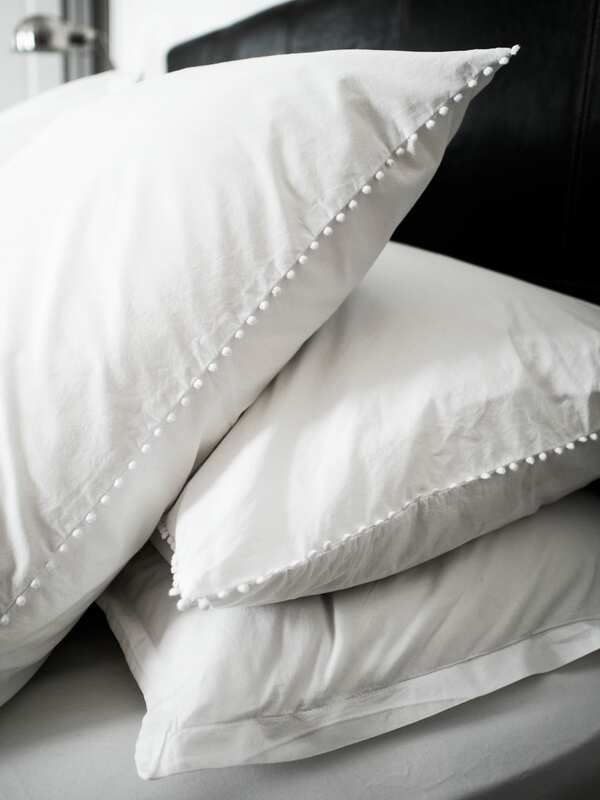 The bottom standard pillowcases and duvet cover are both from Habitat, part of their Percale collection, a 180 thread count Egyptian cotton that is more soft than crisp; it feels really good to be enveloped in. On top of the duvet we have a gorgeous grey quilt, perfect for keeping our feet warm on cold winter nights, or chillier summer ones when I’ll be pulling it up over a flat sheet. It’s another item from The White Company, a brand as you’ve probably gathered by now I’m quite fond of. The quality is just so much better than most you find on the high street. 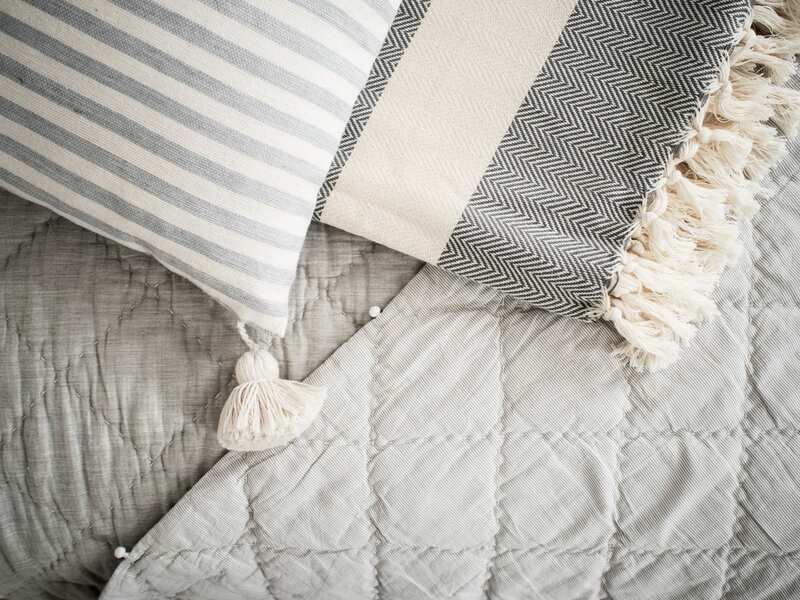 There’s a coordinating cushion that goes with the quilt but I prefer not to have everything too matchy-matchy, mine’s from Wood/Grey, an incredible little website that sources some really beautiful and unusual designs for the home. They have some great beauty products, too, like Herbivore Botanicals. 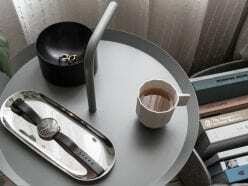 The herringbone blanket across the bed is also from them. I think it’s really important to have great textiles on the floor, too. Wandering around the room barefoot you want to feel something soft under your feet. When I first featured this Beni Ourain style rug from West Elm I had no idea that it was going to be so soft! It’s the sort of rug you stop just to wriggle your toes in. I cannot express just how happy I am with it. Downstairs we have floorboards and tiles so I wear slippers most of the time. These Mahabis ones have a soft wool lining, squidgy cushioned inner sole and detachable outer soles which convert them into an outdoor shoe. They’re really warm and comfortable. I would love to know if you’ve tried any of the products and what you thought of them. Or if you have any great recommendations please let me know in the comments section below.